Different from common or commercial display cases, museum grade display cases are equipped with micro climate control system, or passive one like silica gel tray or active one like electronic micro-climate units to keep relatively constant or preset humidity and temperature within display space so that priceless museum exhibits will not be disintegrated or degraded be possibly damaged due to abnormal humidity and temperature.Passive or active micro-climate systems are discretely installed within lower lockable plinths/bases which are completely independent from internal display space.Air will exchange between micro-climate chamber and display space through pores,to input humid air into display space or absorb or take away surplus humidity within display space. Silicon gel dehumidifier such as Prosorb or Artsorb, will be put in the discrete,sealed and lockable steel boxes with invisible air pores interlinked with internal display spaces,to passively absorb or release moisture through air exchange for balancing the relative humidity with adjustment precision at ±5% for relative humidity between 40%-60%. With longer life span and the exceptional ability of absorbing surpassed moisture and desorbing absorbed moisture,Prosorb is preferred silica gel ideally suitable to passive relative humidity adjustment for museum grade display cases,showcases,display cabinets.Prosorb will keep relatively constant humidity between 40%–60% RH,an ideal humidity range for most of museum objects.Prosorb usually come with rigid plastic cassettes which are built by sturdy polypropylene and vapour permeable non-woven polyester fabric, with loose beads filled. *Free of chlorides-PROSorb contains no lithium chloride, as some other products do (Lithium chloride is a chemical - salt, potentially harmful to many metals. This salt can be transferred to metals in dust or by human touch). PROSorb consists of 97% SiO2 and 3% Al2O3. 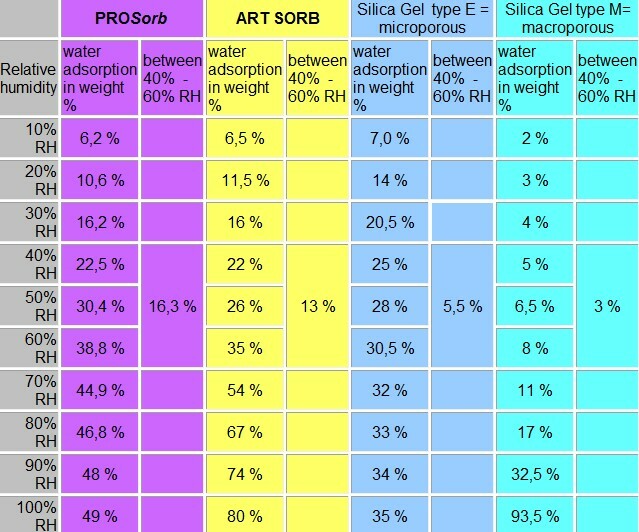 *Low abrasion-PROSorb beads produce less dust than other silica gels (abrasion < 0,05 weight-% according to MIL-D). *High bulk density-1 kg PROSorb only needs a volume of ca. 1,5 l (much less than some other silica gels). *Long term stability-PROSorb maintains the greater part of its capacity well beyond the 2-5 years when other silica gels have lost a large portion of their capacity. *Economical-PROSorb is much cheaper than the other products sold for the same purpose. *Temperature dependency-PROSorb is conditioned in relation to temperature. PROSorb reacts in the same way organic materials do. Therefore there will be no, or little, transfer of water vapour between organic materials and PROSorb if the temperature changes. Under fluctuating temperatures this property protects wooden objects and other organic materials from swelling or shrinking: The conditioning indicated on the labels refers to 20°C. At 10°C the conditioning of the cassettes will be around 1 - 1,5 % RH lower, at 30°C around 1 - 1,5 % RH higher. Dimensions: L 335 mm, W 110 mm, H 44 mm. Dimensions: L 335 mm, W 110 mm, H 24 mm. Electronic active micro-climate control system usually keeps relative humidity between 35%~75% with high control precision ±1.5%, and customized climate system can maintain humidity between 20%~ 80%.Active climate control system will automatically identify preset humidity value and actively dehumidify or humidify to maintain humidity within the preset range.The air positive pressure function of the system will stop air pollutants at external atmosphere to enter into display space of museum display cases. The active climate system with combined dehumidifier and humidifier unit is usually installed invisibly in the lower discrete and lockable plinth of museum display cases/showcases. The display space of museum display cases/showcases is interlinked to the Climate system by two flexible hoses, forming an airtight recirculation system.Air will be actively extracted from display space into climate system or will be actively circulated back into display space. 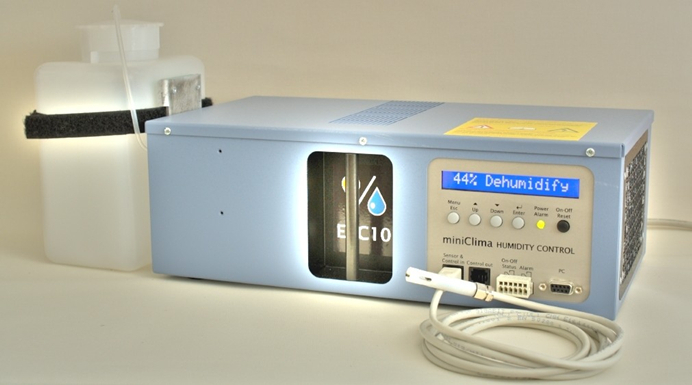 The sensors within display space will real-timely monitor both temperature and relative humidity,and will keep continuous communication with climate system after the preferred climate value is preset well.When monitored RH value deviates from the preset one, the dehumidification by condensing or humidification by evaporation will be immediately activated automatically. A 500 ml water tank is integrated together with active climate system for condensate supply for dehumidification process and also for reservoir use for the humidification process. 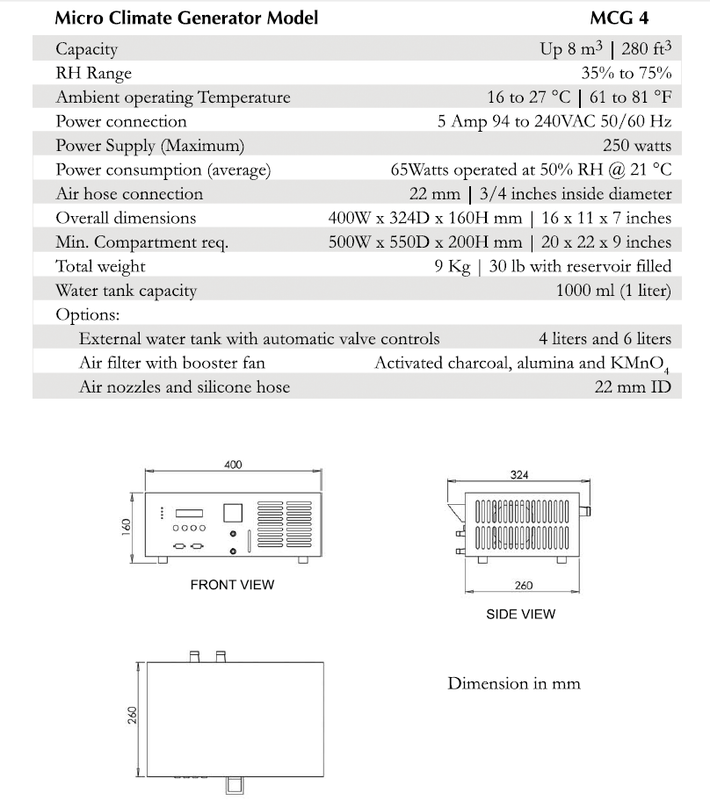 The modes of operation "humidification" and "dehumidification" are indicated visually on the control panel. Alarming will be activated once the preset climate value not be reached.Remote alarming signal conveying can be customized and incorporated through wireless intelligence system. One basic-model of micro-climate unit will work well for well-sealed display space not more than 8m³,and for larger display space, more units will be needed or special climate units will be customized. A slave unit will be controlled by it's associated master unit.